Pauline started campaigning outside prisons following the suicide of her only daughter Sarah at 18 years old in Styal Prison in 2003. She campaigned for the next five years, protesting outside Holloway all too frequently every time there was a death in custody. Pauline, having repeatedly been arrested (15 times) was not sent to prison, where she had wanted to be sent to illustrate the dangers of the institution. Here is an excerpt from a piece written by Pauline that can be found at No More Prisons which gives us an idea of how dire Holloway was in the early 2000's. Remembering Karen Ann Fletcher "It is believed that Karen Fletcher was recently transferred to Holloway from Styal Prison, Cheshire. Her death, the fourth at HMP Holloway since April 2004, again raises questions about the legal duty of care owed to prisoners. In addition, a Holloway inmate remains on a life support machine, after being cut down from a makeshift noose at the jail in May 2004. The Chief Inspector of Prisons' report, published earlier this year, highlighted problems of dirt and vermin at HMP Holloway." In 2008, Pauline took her own life on her daughter’s grave. In the intervening years between her daughter’s death and Pauline’s suicide 44 women had died in prisons.Last year women's self harm and self inflicted deaths in custody were back to the levels they were at when Pauline started campaigning. You can read Pauline's Obituary in The Guardian. Thanks to No More Prisons for sending us in photographs of Pauline. We think about Pauline a lot at Holloway Prison Stories. In fact her story was a big part of why we set up this website. If you have any memories or stories about Pauline or feel this piece could be amended, please let us know. If you are affected by Pauline's story, please reach out to someone. Samaritans can be called on 116 123 from any phone, for free. Founded by former Holloway prisoner, and Drugs Worker Mandy Ogunmokun Treasures Foundation was started in 2011 to aid women with substance misuse issues and housing needs. Treasures now runs three connecting houses located in East London that are professionally staffed day and night to provide continuous individual support to nine women leaving prison. “After running employability workshops in HMP Holloway, Jocelyn Hillman,(OBE) was determined that the untapped potential of the women she met be recognised. In 2007, she founded Working Chance, a specialist recruitment consultancy for women exoffenders, to help them get quality, paid work and become financially autonomous. The charity is now based in a busy office in north London. There, a skilled team of recruitment consultants, 40% of whom are ex-offenders themselves, help women get work and employers to break down barriers to diversity. Since 2007, Working Chance has helped place more than 1000 women into jobs so that they can become role models to their children and communities." Rai, S. (2017). Working Chance operated from Angel, Islington and also have offices in Manchester and HMP Downview. Rai, S. (2017). Jocelyn Hillman founder of Working Chance awarded OBE > Working Chance. [online] Workingchance.org. Available at: http://www.workingchance.org/AboutUs/Ourblogs/tabid/1082/articleType/ArticleView/articleId/47/Jocel yn_Hillman_founder_of_Working_Chance_awarded_OBE.aspx [Accessed 7 Jun. 2017]. Established by psychotherapist at Holloway Pamela Wyndham-Stewart. Pamela worked with mothers and babies in prisons since 1996. She gained a distinction in her MA from the Tavistock Clinic, in 1998 with her dissertation “Born Inside”, a study of mothers and babies in prison. The project is funded by the Maria Montessori Institute to provide a parental support programme for women in the Mother and Baby unit at Holloway, and now continues at HMP Bronzefield. Holloway Prison's visitors' centre, was opened in 1996 as a result of the work of penal reformer Una Padel who raised money from trusts and foundations to renovate the former staff mess. In 1993 she started a project called the London Prisons Community Links (LPCL) whose aim was to set up visitor centres at all of London's prisons. After this she founded CLINKS, an organisation whose goal was to encourage voluntary organisations to offer services in prison. Una Padel OBEwas Director of Centre for Crime and Justice Studies between 1999 and her death from cancer in 2006 at 50. Centre for Crime and Justice Studies run the project Community Plan for Holloway. Today they, along with community groups and organisations are calling for the Visitor Centre to be made available immediately for interim use for community benefit. After which followed a high profile campaign to end the use of handcuffs on female prisoners during labour. "Sheila Kitzinger, the well known childbirth sociologist, wrote an article about women prisoners giving birth without support from friends or family. Sheila’s article inspired a small group of London-based antenatal teachers to set up the ‘Holloway Doula Group’. The group expanded to become Birth Companions and are now a registered charity with a team of staff and volunteers. Known as Wish, (formerly as Women in Secure Hospitals), they were founded around the same time as Women in Prison and Hibiscus (see earlier posts). Similarly Wish were born of radical roots, and have remained consistent in their rejection of co-option, avoiding the lure of legitimacy they are steadfast in their criticism of both the prison and secure hospital systems treatment of women. Wish had a continued presence supporting women with mental health needs in Holloway, regularly supporting women with the most severe and enduring mental health conditions on the C1 and the Day Centre. Wish support women through advocacy within the prison, meeting them at the prison gate on their release, and providing continuing support in the community. The following history is taken from Women at Wish 'Our History' found here. "Wish is a national charity that was set up in 1987 by Prue Stevenson, Terri Simpson and Kimberley Andrews. At the time, Prue was working in the Education Department at HMP Holloway in London. She became concerned about the high number of women whose mental health deteriorated to such an extent that they were transferred to the High Secure Hospitals, then known as Special Hospitals. Terri and Kim were former patients who had spent many years in High Secure hospitals. Female patients in these hospitals were often subjected to appalling and degrading conditions, and many didn’t require such a high level of security. The three women got together to form Wish with the aim of supporting women still in Special Hospitals and prison psychiatric units, and to campaign to change policy and attitudes. The first office was based in London, initially serving Broadmoor and HMP Holloway, and over time branches were set up in the Midlands to serve Rampton and in the North to serve Ashworth. The women’s services at Ashworth and Broadmoor have since closed, resulting in more women being moved to lower, more appropriate, levels of security. Wish’s work to emphasise the importance of gender and the different needs of women contributed to the Department of Health strategy for women’s mental health, titled ‘Into the Mainstream’. Today, Wish works with women at all levels of security, as well as in prisons and in the community. Over two decades after it was founded, Wish is now returning to its campaigning roots, as well as continuing to provide independent advocacy and emotional support to women with mental health needs in secure settings and in the community." Wish have helped the women they support to submit stories to this website, and we would like to take this opportunity to thank them. Hibiscus Initiatives* was founded in 1986 by Olga Heaven MBE. The organisation emerged at a similar time with Women in Prison, and Olga Heaven was on the board of Women in Prison. Over the same period Hibiscus ran many projects and services in Holloway. Hibiscus have developed a widely acknowledged specialist expertise in working with foreign national, Black and Minority Ethnic groups and migrant offenders and detainees in custody, detention and the community. Today Hibiscus Initiatives run a Big Lottery -funded Women Centre on Holloway Road. The Centre is a specialist women-only space created to provide tailored facilities and services and the opportunity to socialise with others who may be going through similar experiences, reducing isolation and distress. The Centre offers a range of training sessions, education classes, workshops, yoga and well-being sessions, legal clinics and one-to-one sessions with caseworkers or professionals. Women in Prison (WIP) was established in 1983 by Chris Tchaikovsky, a former prisoner of Holloway, and academic Pat Carlen, emerging with support from Radical Alternatives to Prison (see previous post). Chris had been in Holloway on minor offences, but during her last stay in the prison in 1974, Patricia Cummings burned herself to death in a cell. Chris learnt later another women burned herself alive in the prison and Women in Prison was originally a campaigning organisation, born out of a rage against the injustices she [Tchaikovsky] saw there. Christine Scott had died in 1982 after injuries sustained from throwing herself around her cell for up to 24 hours. A Belgian woman died the same year, refused an asthma spray or medication for a heart condition. Written in 1983, WiP’s original manifesto contained ten demands for women prisoners, and ten demands for all prisoners. Encapsulating a strong desire for prisoners to self-organise and be a collective democratic instrument to subvert and redistribute power universally and democratically. The first point of the manifesto of women prisoners was"Improved safety conditions, particularly in Holloway Prison where women have been burned to death in their cells" The first point on the manifesto for all prisoners was the democratisation of the criminal and penal justice system in Britain. The origin story of WiP should be understood in ideological terms associated with prison abolition, collective emancipation and solidarity and while the organisation focused on campaigning to change conditions for women, they were concerned with the prison system as a whole. Women in Prison ran many projects and services in Holloway between their beginnings and the prisons closure in 2016. Women in Prison continues to work today, supporting women in women’s prison in England. They recently moved from their Islington base, having been located in the borough since their beginnings, due to the rise in rents and the closure of the prison. Women in Prison run Women’s Centres in Woking, Manchester and Lambeth for women who have had contact with the criminal justice system. They have a magazine (Ready, Steady, Go) that is produced for women in prison, by women in prison, that goes into each women's prison in England, and features women's stories. Women in Prison have a current campaign 2,020 by 2020 focusing on a radical reduction of the women's prison population. Chris died in 2002 at the age of 57 from cancer, her obituary can be found here. More information about Women in Prison's early years written by Professor Pat Carlen, can be found here. The Griffins Society was established in 1965 to provide hostel accommodation for women leaving Holloway, with funds from the disbanded HMP Holloway’s Discharged Prisoners’ Aid Society. The name came about from the two statues that had stood at either side of the Prison gates, which were within the prison grounds, and are now at the Museum of London. The Griffins Society, set up the first ever female-only bail hostel Kelley House in Kings Cross. Over a period of 30 years they developed 5 hostels for women offenders, in North London, but in late 1990’s they transferred hostels to a larger voluntary organisation. In 1999, following a research report commissioned by the society to evaluate their work by Dr Judith Rumgay, the society took a different direction. Her work identified a large gap in evidence-based research into the resettlement needs of women either on community sentences or coming out of prison. In 2001 they established an annual Research Fellowship Programme specifically for practitioners working with women in criminal justice, to carry out research into the treatment of women with the aim of bringing about change to both practice and policy. Initially the society’s academic partner was atthe London School of Economics, but since 2014 they have been in partnership with the Institute of Criminology, University of Cambridge delivering about six fellowships each year on a range of subjects, and no longer only on resettlement. Women have been moved to set about addressing practical issues facing women in prison, while campaigning for systemic changes since the beginning of the prison itself (see post on Duchess of Bedford). The heritage of Holloway Prison as a prison, as a site of resistance is important to the development of a Women’s Building. Resistance comes in many forms, which includes growing pockets of support in the face of immeasurable difficulty. Keeping going, despite being knocked back, locked out, tested to the last. While at times A Women’s Building might feel like an impossible dream, we already know is that Holloway inspired the birth of these organisations and projects, despite the odds. The majority of the organisations listed join in the call for a Women’s Building on the site, and having worked together in Holloway for decades. It is easy to see how a Women’s Building could provide a good home for further cross pollination of future ideas, collaborations no longer constrained by prison walls. Some organisations were born of radical, anti prison roots while others are more easily understood as emerging from within the system, and reformist in their approach, all believed in the importance of specialist provision for women. Spanning from 1965 right up to 2016, the following posts will focus on some of the women who inspired by what they witnessed in the prison, started their own projects or organisations to address issues ranging from education, to maternal healthcare. Featuring The Griffins, Women in Prison, Hibiscus Initiatives, Women at Wish, Birth Companions, The Visitor Centre, Born Inside, Working Chance, Treasures Foundation, HUT. Projects that now live on, having supported thousands of women, where once they were but an impossible dream. While we focus on the women and the projects, it must be said that while on the one hand the difficult circumstances of the prison inspired these projects, on the other hand the prisons cooperation and willingness to work with community projects sustained them. This is not an exhaustive list of those inspired by the prison to establish something, please submit to info@hollowayprisonstories.com if you think we should be including women, projects or organisations you know of. Any Women’s Building that will emerge from the legacy of Holloway Prison, will be built on the shoulders of the following women, and will be sustained on the shoulders of women to come. 01 Mar 1983 friends and supporter waited outside the prison for the campaigners to be released. the Guardian. (2017). The Greenham Common peace camp and its legacy. [online] Available at: https://www.theguardian.com/uk/2006/sep/05/greenham5 [Accessed 7 Jun. 2017]. Maydayrooms.org. (2017). MayDay Rooms » Greenham Common Women’s Peace Movement. [online] Available at: http://maydayrooms.org/archives/greenham-common-womens-peace-movement/ [Accessed 7 Jun. 2017]. Spare Rib was a second-wave feminist magazine in the United Kingdom that emerged from the counter culture of the late 1960s Spare Rib is now recognised as an iconic magazine, and a place which shaped debate about feminism in the UK. It contained new writing and creative contributions which challenged stereotypes and supported collective solutions. The magazine existed between 1972 and 1993.” In issue 001 of Spare Rib, published in 1972 it featured an article entitled ‘Rapping on Holloway’ about the Radical Alternatives to Prisons report on the prison. ‘RADICAL ALTERNATIVES TO PRISONS’ (RAP). Were critical of punitive responses issues of inequalities, they felt strongly that punishment/prison was an inadequate method of achieving behaviour change. RAP convened a conference on women in prison. From this meeting a campaign was organised against the rebuilding of Holloway women's prison as a secure hospital which would have minimal custodial facilities. There were demonstrations and exhibitions and a pamphlet, Alternatives to Holloway, was published in May 1972. The pamphlet pointed to the facts of female crime and argued that too many women were remanded unnecessarily in custody, that many offences could be dealt with by other means, and that women should not be imprisoned for offences such as alcoholism, child cruelty and petty theft. Instead, RAP suggested that community-based projects should be introduced which would 'make prison for women seem irrelevant'. The new Holloway was a £6 million 'folly' which would detain women 'unnecessarily labelled as criminal and then treat them in an institutional setting which was almost bound to fail' (Ryan, 1978, pp. 102- 5)”. While the campaign was not successful it did significantly raise the profile of the treatment of women in prison over the next fifteen years and where a proliferation of academic work on the topic emerged, which eventually contributed to conditions improving. Reclaim Holloway, a campaign group with Intersectional Feminist. Abolitionist, Anti Carceral principles and are calling for the Public Land that Holloway is built on to be used to built community solutions that would reduce the use of incarceration. They are campaigning against the Ministry of Justices desire to sell the land at the highest value to public new prisons further way. Over 40 years later Reclaim Holloway are suggesting similar solutions to Radical Alternatives to Prison, social housing, a Women's Building, and that money is not pumped into building prisons. Holloway's heritage has shown us that the 'old for new' prison building project has already been tried and tested and failed. Why repeat the mistakes of the past, when we have a moment in time to take a different road. Sim, J. (2017). The abolitionist approach: a British perspective (Part One of Two). [online] Nomoreprison.blogspot.co.uk. Available at: http://nomoreprison.blogspot.co.uk/2010/06/abolitionistapproach-british.html [Accessed 7 Jun. 2017]. Helen Allegranza, a Quaker and pacifist and leading member of the Committee of 100, a group dedicated to nuclear disarmament. The only women from the committee to be imprisoned, was sentenced in 1962 to twelve months in Holloway following Special Branch raids on the Committee offices. 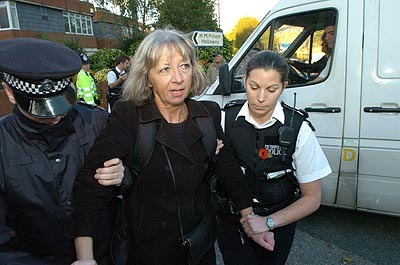 Her trial had exposed the extent and seriousness of the Committee’s call for mass civil disobedience against Britain’s nuclear policy. Humiliated by her prison sentence, Helen Allegranza took her own life. Weyman, D. (2017). Watching, waiting cease. [online] Compusmall.co.uk. Available at: http://www.compusmall.co.uk/benedictsark/index.php/stephen-batty/116-watching-waiting-cease [Accessed 7 Jun. 2017]. In the mid-twentieth century members of the Prison Medical Reform Council published accounts of medical care in prisons including Holloway. Dame Kathleen Lonsdale, a British crystallographer, is an important figure in the history of women in science. For example, she was one of the two first women to be elected as a Fellow of the Royal Society in 1945 and she was the first female president of the British Association for the Advancement of Science. She was a pacifist and during the Second World War she was imprisoned for one month in Holloway for refusing to register for civil defence duties. In 1943 she recounted details of her time in the prison in a publication by the Prison Medical Reform Council. She spoke of the conditions facing women, including those related to medical care and the lack of adequate sanitary care provisions. Minnie Lansbury became a teacher, and joined the East London Federation of Suffragettes in 1915. She was also chairman of the War Pensions Committee, fighting for the rights of widows, orphans and wounded from World War I. She was elected alderman on Poplar’s first Labour council in 1919, before women received Parliamentary suffrage. She and Susan Lawrence were part of the Labour group that defied central government and refused to set a rate, arguing that the poverty in the area meant that the poor were being asked to pay for the poor. Lawrence was imprisoned for five weeks in Holloway Prison in 1921, but ultimately she and her fellow councillors' campaign succeeded, in that government passed a law to equalise Poor Law rates. Writs were served on 30 Popular councillors, who were jailed in September 1921. Twenty four male councillors went to Brixton prison, while six women were held at Holloway. The arrests took place over a number of days and attracted huge attention, and a film was made of them. Fifteen thousand people marched to Holloway to support the jailed women councillors with trade union banners much in evidence. The struggle was also reported in the Daily Herald, the edition of the paper for 5 September 1921 had the headline 'Our Editor In Gaol For Justice' of which George Lansbury was editor. The fight of the councillors attracted national attention and the area became known as 'Red Poplar' Supporters singing the Red Flag and a huge number of visitors continually harassed the prison authorities. The campaigning pressure forced the Home Office to allow all 34 councillors to hold Poplar council meetings in Brixton prison.Women were taken by cab to Brixton where council meetings were held. Susan Lawrence used the time to read Tolstoy and prepare a pamphlet on taxation. However conditions in prison were not pleasant. Several councillors became ill and within a few weeks of her release Minnie Lansbury, one of George Lansbury's sisters, had died, partly as a result of her treatment in Holloway where she caught pneumonia and never fully recovered her health. The Minnie Lansbury Clock bares the plaque inscription "The clock above was erected by public subscription in memory of Minnie Lansbury who after a life devoted to the service of the poor of this borough, died on New Year's Day, 1922, aged 32 years." In 2008 the clock was restored through a public appeal organised by the Jewish East End Celebration Society and the Heritage of London Trust and included contribution from actress Angela Lansbury, whose father Edgar Lansbury had been married to Minnie prior to her early death. Jackson, S. (2017). Minnie Lansbury: Teacher, union activist, suffragette, rebel councillor. In 1918 Maud Gonne was arrested and imprisoned in Holloway along with Countess Constance Markievicz revolutionary Irish nationalists, suffragette and socialists. They were accused of being involved in the “German Plot” when it was alleged that they were in league with Germany against Britain. Countess Constance Markievicz (nee Gore Booth) was in elected Sinn Fein MP for Dublin St Patricks from her cell in Holloway prison. Becoming the first women elected MP to British House of Commons Westminster, beating her opponent with 66% of the vote. She was imprisoned in Holloway during the first Dail (Parliament) in Ireland in 1919. Called as those elected in the 1918 General Election refused to recognise the Parliament of the United Kingdom. When her name as read out in the Dail she was cited as being "imprisoned by the foreign enemy". She became both the first Irish female Cabinet Minister and at the same time, only the second female government minister in Europe. Hanna Sheehy Skeffington and Margaret Cousin (nee Gillespie) both served time in Holloway and were founding member of the Irish Women’s Workers Union and The Irish Citizen a feminist newspaper and Irish Women's Franchise League Maud Gonne McBride wrote in a letter from Holloway "I have asked repeatedly since the day of my arrival here to see a Solicitor, but I am not allowed. We are not allowed Irish or Labour papers. No charge has been brought against us, yet we are shut up in cells seven feet by 13, with window too high to see out of, and [an] air opening about half a foot, 18 hours out of 24. We meet in the exercise yard while cells are being cleared and for about an hour in the afternoon” As Civil War broke out in Ireland in 1922, Maud Gonne founded the Women’s Prisoners’ Defence league with Hanna Sheehy Skeffington and Charlotte Despard “for the help, comfort and release of” Republican prisoners. They campaigned and fundraised for over 7000 republicans who were imprisoned as a consequence of the Irish Civil War. The organization of “mothers” as Maud called them, was banned a year later. The group also introduced the lily as a symbol of the Rising of Easter 1916. The lily is still used today by Irish Republicans to remember the rebellion and those that died.